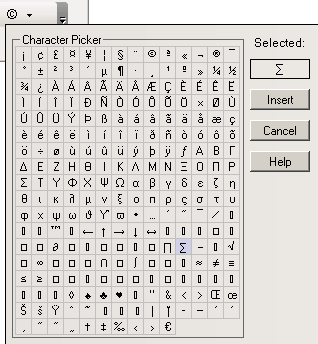 Click the icon on the left to use the currently selected character (shown by the icon). By clicking the arrow on the right, the Character Picker window will be displayed allowing you to select the character that you need. It displays a matrix of characters from which you can choose. The Selected display item shows the symbol you select in the matrix (single-click). Click Insert to insert the selected character in page. Click Cancel to annul any character selection or insertion in your page. A horizontal rule will help you visually separate elements. In the Element ID text box enter the value for the id attribute. It will uniquely identify the element (horizontal rule) in page. The width of a horizontal rule is relative to the page width. In the Width text box enter a number that can represent either pixels or percents (of the page width). Select one of these two options from the associated drop-down menu. In the Height text box enter the number of pixels for the horizontal rule's height. The greater the number is, the deeper the delimitation space (between the two paragraphs the horizontal line separates) will be. Note: If the rule is as wide as the page, aligning it to the left, right, center, would not make a difference in its position. But when the rule's width is smaller than the page width, then its alignment options will be visible. If you check the Shading option, the inside area of the horizontal rule (its thickness is given but the height) will be transparent. If left unchecked, the rectangle corresponding to the horizontal rule will be filled with a shade of gray.